If you look in the dictionary under “decadent” there is a picture of this cake. Actually, there should be a picture of me eating this cake. From the book You Be Sweet via the fine folks at She Cooks He Cleans. Preheat the oven to 300F. Grease an 8-inch round springform pan, and line with parchment paper. Sprinkle paper with a bit of cocoa powder. Melt the butter in a medium-sized microwave-safe bowl (we used a 1-quart Pyrex measuring cup). Add the chocolate chips and stir until they stop melting. Microwave in 5-10 second bursts, stirring in between, until the chocolate is uniformly melted. In a separate bowl, mix together the sugar, eggs, salt, and vanilla. Slowly beat the egg and sugar mixture into the chocolate mixture, stirring constantly to keep the eggs from getting cooked. Pour the batter into the springform pan, and bake for 30 to 35 minutes, or until a toothpick inserted into the center comes out clean. Let cool for 10 minutes in the pan before turning it out onto a serving plate. In a small saucepan, bring the cream to a simmer over medium heat. Remove from heat and stir in the chocolate chips. Stir until smooth, then stir in the vanilla. 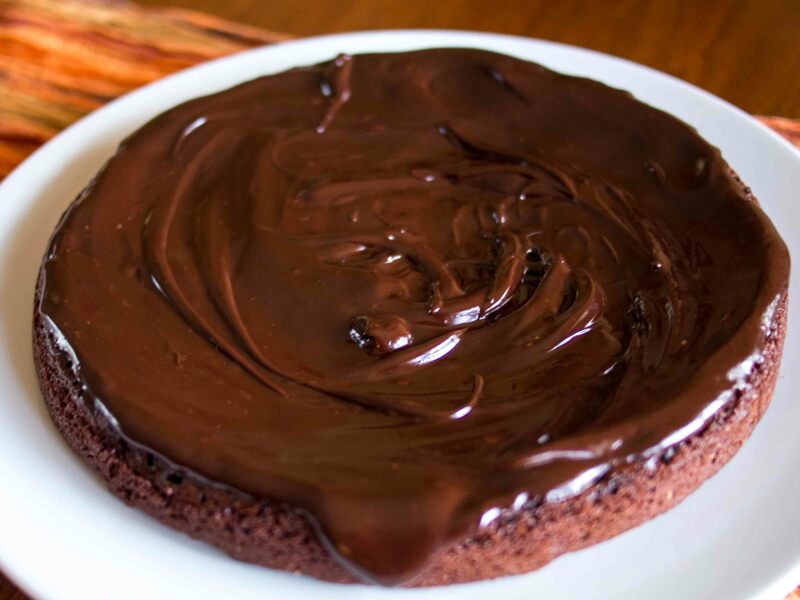 Pour the molten goodness over the cake and spread it out evenly. Lick clean every bowl and utensil used in making the ganache. 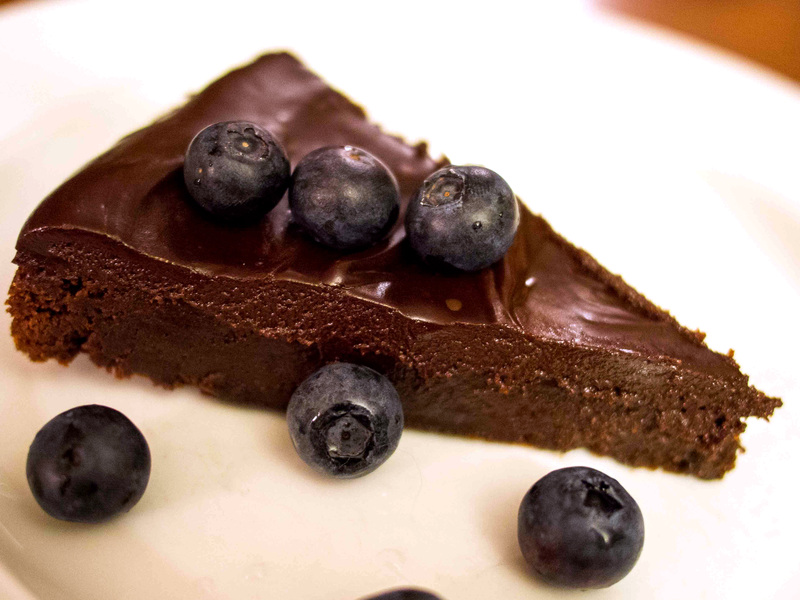 Move cake to fridge and let chill for at least 20 minutes before serving. I wish a had 6 stars for this this cake. The first time I served it at room temp and it was great. The next time I served it chilled and it was phenomenally rich and fudgy. Not even going to go there. The only good thing is that a very slim piece is very satisfying. I am still working on perfecting a barbecue sauce for the upcoming graduation party. My last version of the Honey Hog sauce was very good, but after repeated tastings it just wasn’t quite what I wanted. I ended up cutting it 50/50 with cider vinegar and will use it as a finishing sauce when I reheat the pork. Rather than continue to tweak existing recipes, I started from scratch. I wanted a “Gee-wiz! Woosh-bang!” kind of sauce that could just about knock the bun off. I decided that the key to getting this is the sweet/tart flavor of the pomegranate molasses and the way it complements rich, smoky meats. This recipe lets it take the starring role. 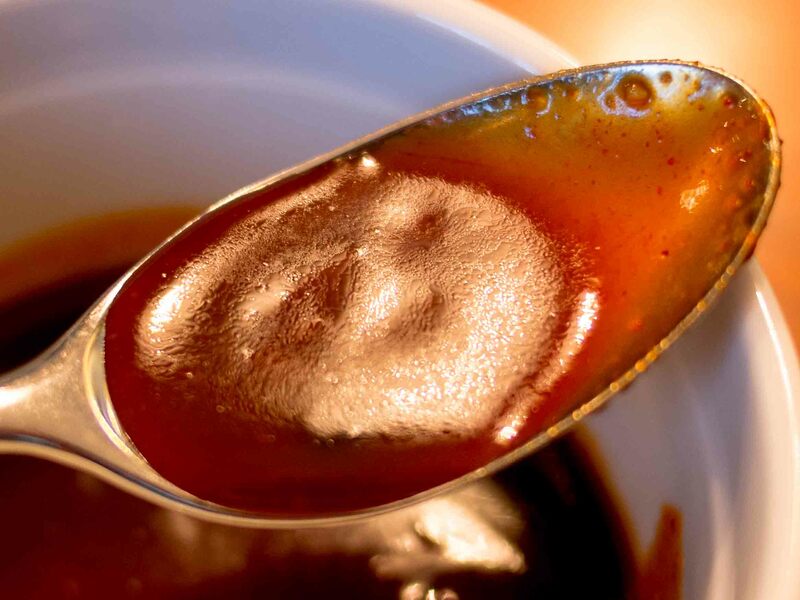 Combine sugar, syrup, paste, vinegar, Worcestershire, molasses and salt. Wisk to combine. Bring to a boil (careful as it will foam up and bite you). Reduce heat and simmer for 5 minutes. This is your sauce base. If it doesn’t taste great, the rest of the ingredients aren’t going to save it. Taste for sweetness, acid, umami, and salt. Adjust accordingly. Turn the heat off and add the garlic, chili powder, paprika, pepper, onion, vanilla, cayenne, sage, thyme, allspice, nutmeg, and cumin. Wisk to combine. Bring to a boil again then reduce heat to lowest setting and let sauce cook for another 10 minutes. Remove from heat and let cool. Bottle and store in the fridge. Makes about 1 quart. I’ll wait until after the party to give a final verdict on this sauce, but the initial tasting went really well. This is a syrupy sauce, but despite all the sugar, it has a lighter mouth feel than you would expect. The tang of the vinegar and pomegranate molasses help even the taste out, and there is just enough heat and spice to make it interesting. I’ll let you know what the crowd has to say. Everyone LOVED the Pomegranate Pig sauce – people were putting it on the hot dogs, stirring it into in the baked beans, and even squirting it on their fingers and then licking them off. I take that all as a good sign. The sauce was thick, sweet, tangy, and complex. The sweetness hit first, but it wasn’t heavy and was quickly replaced by the pomegranate’s fruity tang. The herbs and spices followed with a nice black pepper note in the middle and some lingering heat at the end. I was afraid all the sweetness might make it a one-hit-wonder, but this stuff sang like a a full orchestra. All-in-all, great party, had a good time and am glad everyone liked the pulled pork, but am also glad I’ve got about 8 years before I need to do another one of these ;). There are two sources of inspiration for these wings – the Sriracha Honey Cashew Chicken Stir Fry from Lea Ann at Highlands Ranch Foodie and the tub of Korean chili paste left over from our New Year’s Bo Ssam. I really liked the way the honey, soy sauce, rice vinegar, and sriracha played together in stir-fry sauce, so I started looking at other recipes to bring this combo together and settled on using it as a wing sauce and substituting the it’s-taking-up-too-much-room-in-the-fridge gochujang for the sriracha. Make the brine by combining the lemon juice, honey, garlic, ginger, pepper, salt, and water in a large saucepan. Bring to a boil. Boil for one minute, stirring to dissolve the salt. Remove from the heat, pour into a covered non-reactive container and refrigerate until cool. Once cool, add the wings, arranging so they are all covered in brine. Stash in the fridge for at least 12 hours, but no longer than 24. 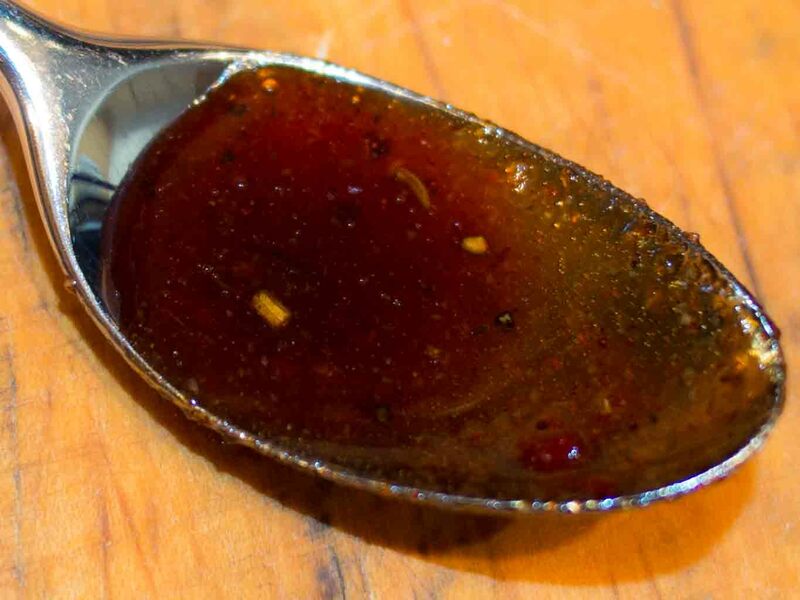 Combine the soy sauce, chili paste, honey, and vinegar in a small pot. Bring to a simmer and cook, stirring occasionally, until sauce is slightly thickened – about 5 minutes. Remove from heat, add the sesame oil, and set aside. About an hour before you plan to grill, remove the wings from the brine, pat them dry, and set them uncovered on a rack in the fridge. This will help keep the skin crispy. Set your grill up for an indirect cook over high (400°F) heat. I set the Big Green Egg up using the inverted plate setter to diffuse the heat. 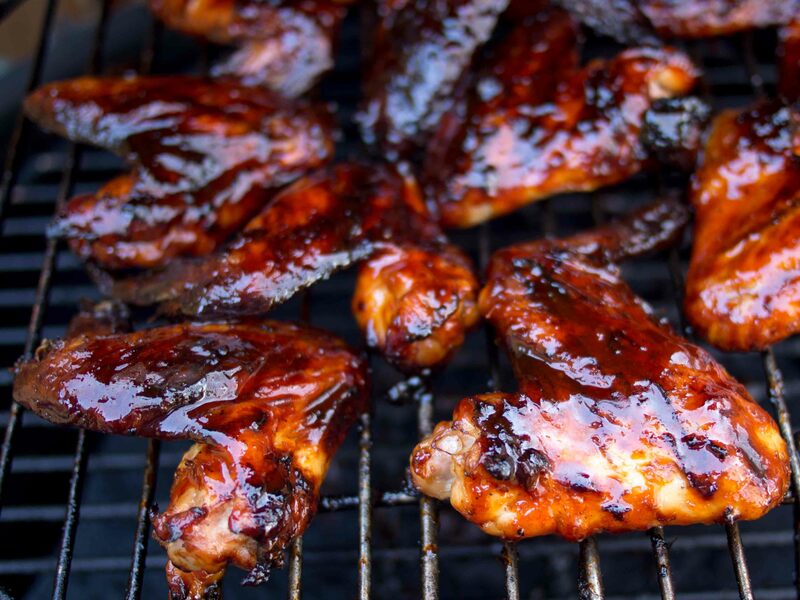 When the grill is ready, put the wings on and let them cook for 30 minutes. Flip them and let them go for another 20. Flip them again and check for doneness. The skin should be fairly crisp and the internal temp should be 165°F or higher. 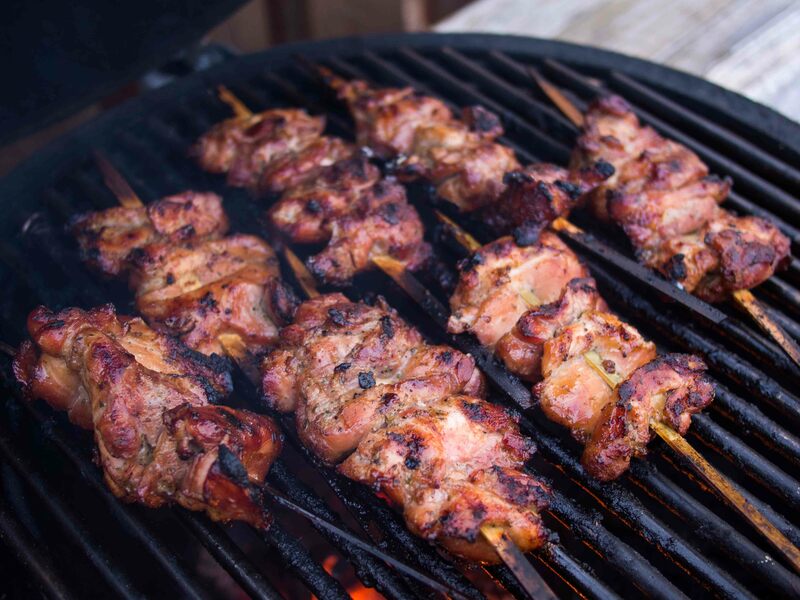 When they are done, baste them with sauce on both sides, then let them cook for another 5 minutes. Sauce them again and let them go for another 5 minutes. Sauce them one last time and move them off to a plate. Let rest 10 minutes, then serve with remaining sauce on the side. 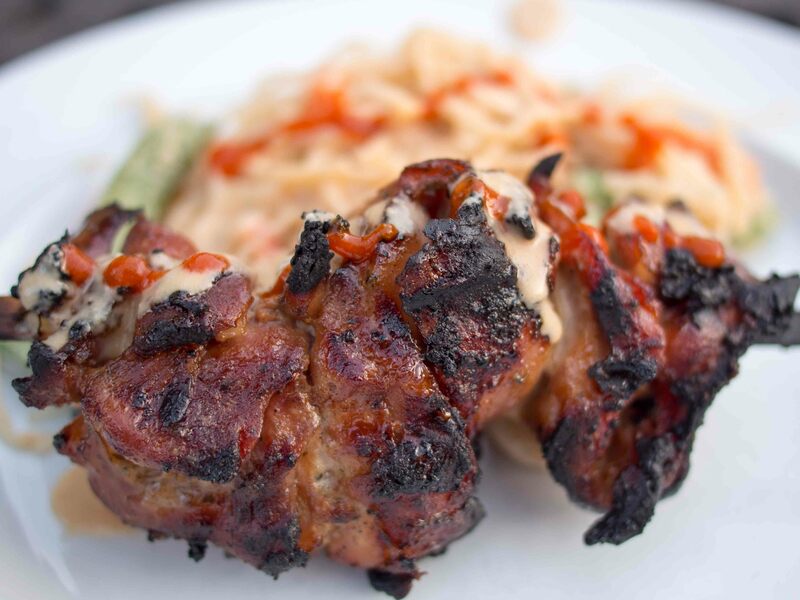 The sauce on these babies absolutely rocked! It was the perfect blend of heat and sweet with a nice umami base. The gochujang I used wasn’t too fiery (Koreans probably use it as baby food), but the heat was very rich and consistent. I might add a teaspoon or so of garlic chili paste next time to brighten the heat a little bit. I also see this sauce glazing some pork chops in the near future. Why not 5 stars? As I’ve said before: a good chicken wing must be crispy, it must be spicy enough to require a cold adult beverage, and it should be flavorful enough to be addictive. 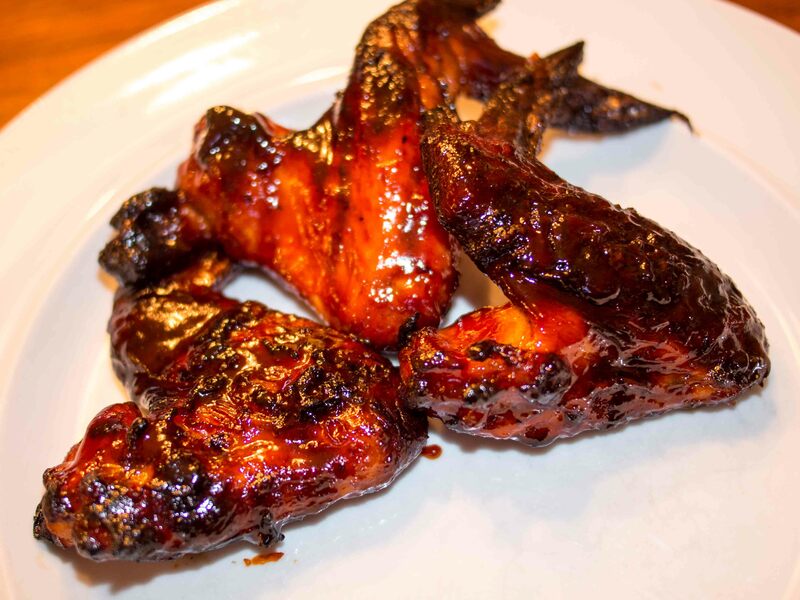 These wing hit 2 outta 3 – the brine made the wings nice and juicy, but it also made the skin a bit rubbery. I would ditch it next time. Sadly, wings are 150 calories and 3 Weight Watchers points a piece. A charcoal review? Really? Just how big of a of a grill geek am I?!? Pretty darned big, thank you very much. 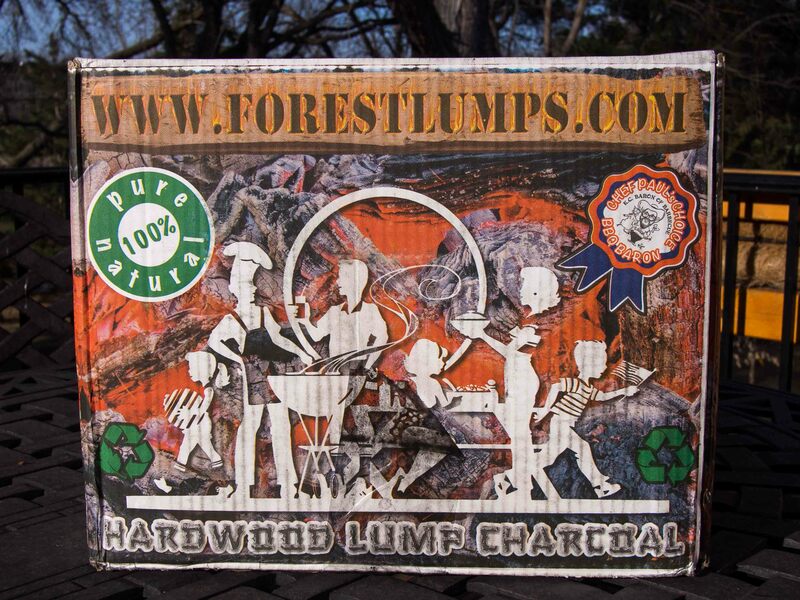 Forestlumps is a new lump charcoal on the market. It’s claim to fame is that it is made from 100% European beechwood – no scrap lumber, no trash woods. It’s also sifted and packed in such a way that you get more uniform medium-sized chunks of lump and fewer huge or tiny pieces. You remember the “Contents may settle due to handling” statement on your cereal box? The same things can happen to lump charcoal, which is pretty brittle. 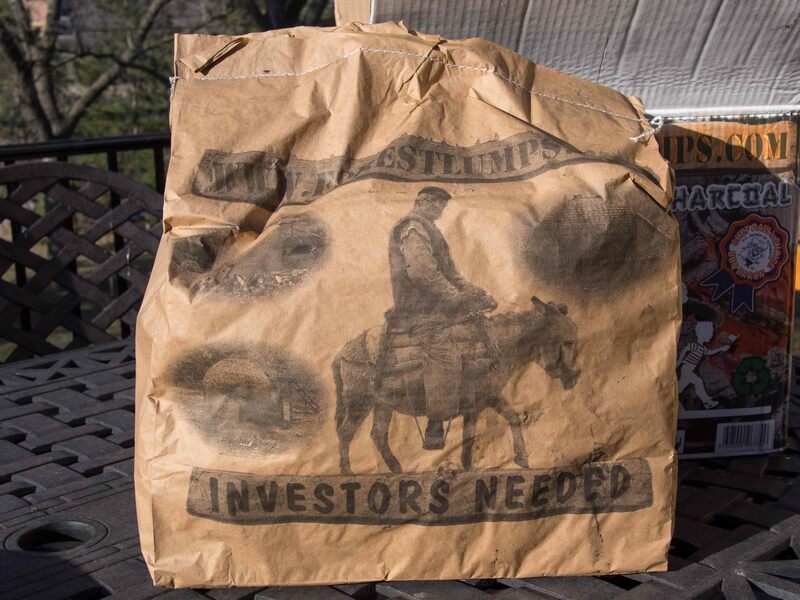 To protect the charcoal from damage during shipping, Forestlumps uses a neat packing method of putting 2 – 10 pound bags of charcoal in a sturdy box. I’ve cooked my way through a 20-pound box of Forestlumps charcoal, doing both low and slow cooks and hot and fast ones. 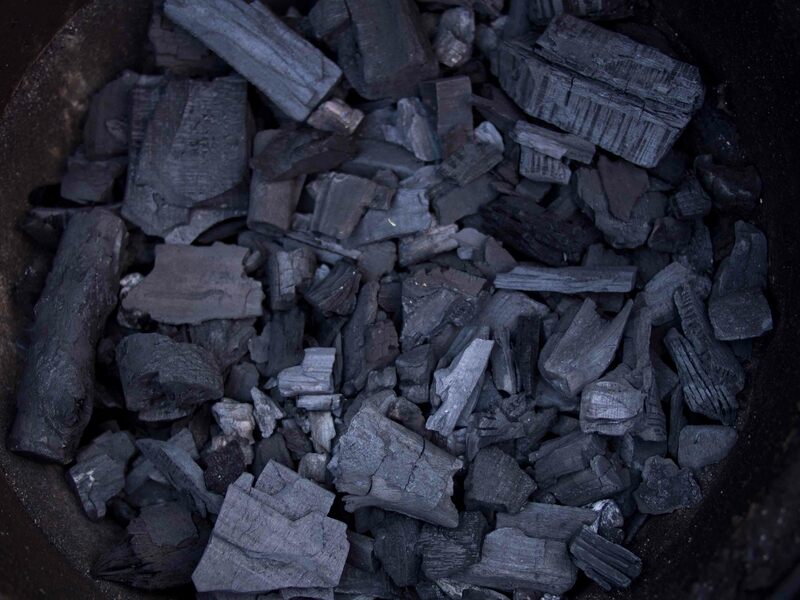 In all cases the charcoal was more medium-sized and consistent in size than I’ve see using Big Green Egg, Royal Oak, or Nature-Glow charcoal. There was almost no dust and very few tiny pieces (fines). The charcoal lights easily and the fire spreads quickly with not much sparking and no popping from the MAPP torch. I noticed that even during the white smoke phase, where a lot of nasty volatile organics are getting burned off, the smoke still smell good. No bitter or sharp odors. When the smoke switched over to blue, it got sweeter and nuttier. This is a hotter-burning lump and I did have the heat get ahead of me a couple of times, so you might want to close your vents down a little more than you normally would. I like the boxes for storing the charcoal and the smaller bags for handling it. At $25 for 20 pounds, and free shipping if you order 2 or more boxes, it is comparable with what I pay for any other brand. Buy the Kindle edition of this blog. Or scan this QR code into your Android phone. Thanks for liking, twittering, buzzing, or stumbling upon me!